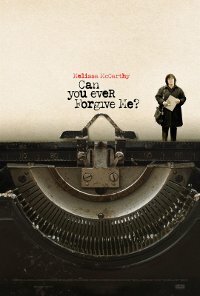 The Moviesite - Can You Ever Forgive Me? Based on a true story, author Lee Israel made her living in the 1970’s and 80’s profiling the likes of Katharine Hepburn, Tallulah Bankhead, Estee Lauder and journalist Dorothy Kilgallen. When she is no longer able to get published because she has fallen out of step with current tastes, she turns her art form to deception, aided by a loyal friend. The film had two Golden Globe nominations and numerous other wins and nominations. No persons under 16 (Language, Drug abuse). Language Frequent strong use of strong language in a swearing context and not disapproved of but justified by context of the biography and true story of the main character’s criminal activities. Violence Infrequent low impact verbally referenced violence and was off screen. Prejudice Infrequent low impact language of prejudice in a form of gender and sexual orientation. Comments Complex and mature themes with moderate impact having some elements with strong impact. Themes of tension between friends after betrayal, controversial gay relationship dynamics, friendship, family, death, coping with the loss of loved pat, alcoholism, enforcement of legal justice system, mourning and in pain due to loss, depressed, loneliness and devastated single, stealing valuable artefacts, impersonating famous writers, resorting to desperate measures, strained relationship, addicts rehabilitation programme as a means to decrease the heavy sentence, court case proceedings that influenced the convicted to confess, plead guilt during trial, less severe sentence due to confessing the truth, aggressive behaviour, apologetic and asking for forgiveness, regretting and adopting acceptable ways of making a living, for the love of the mother, reconciliation and reconsidering actions , dismissed from employment due to alcohol addiction within a biography context. There is a sense of threat which may be disturbing upsetting and distressing to any children fewer than 16 because of its criminal activities and they are also not emotionally, cognitively and morally matured enough to contextualise the shocking content. The disturbing scenes of multiple forgery of letters of famous writers and stealing valuable artefacts that are of a sophisticated in nature can easily evoke emotional and psychological discomfort with moral harm due to the normal way that crude language is used. It can also send a wrong message to young impressionable viewers that you can use crude language without consequences and end up adopting it as part of their daily speech. Noted themes with moderate impact with some classifiable elements that are of strong impact may be ambiguous and disturbing as it is beyond their comprehension and tolerance levels and they are also not morally developed to make appropriate choices that are within the societal acceptable standards.